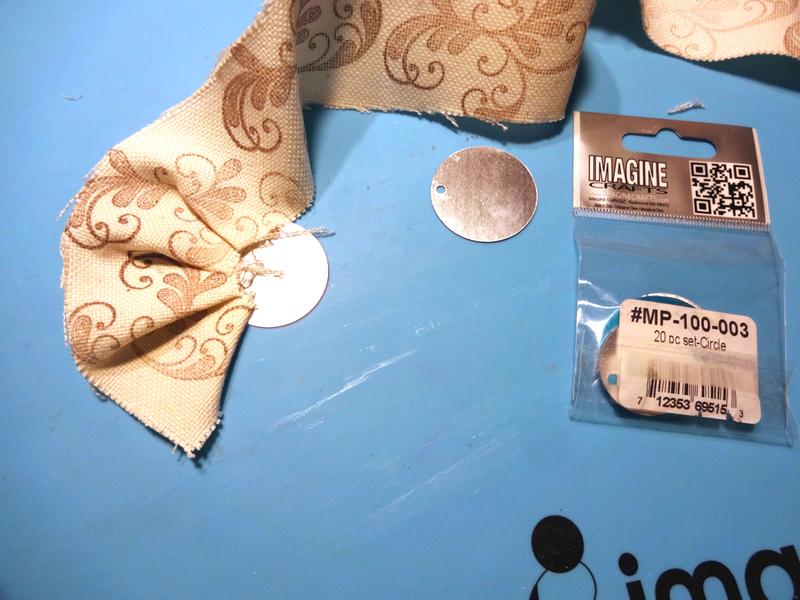 Make your own embellishments that can be uses in various projects like paper crafts, home decoration projects, fashion bags, gift wrapping and more. It is easy to make them using canvas and satin as main fabrics and add lace or ribbons and decorate with a cameo or other embellishments. The fabrics have the desired design by stamping them with your favorite stamps and ink pads. 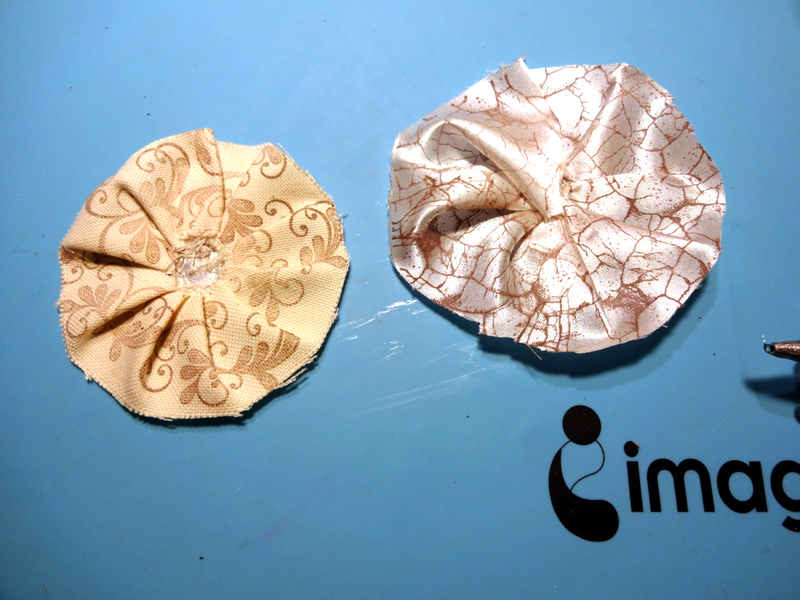 For these rosettes, Memento Luxe Rich Cocoa is used matching the ivory colored fabrics. 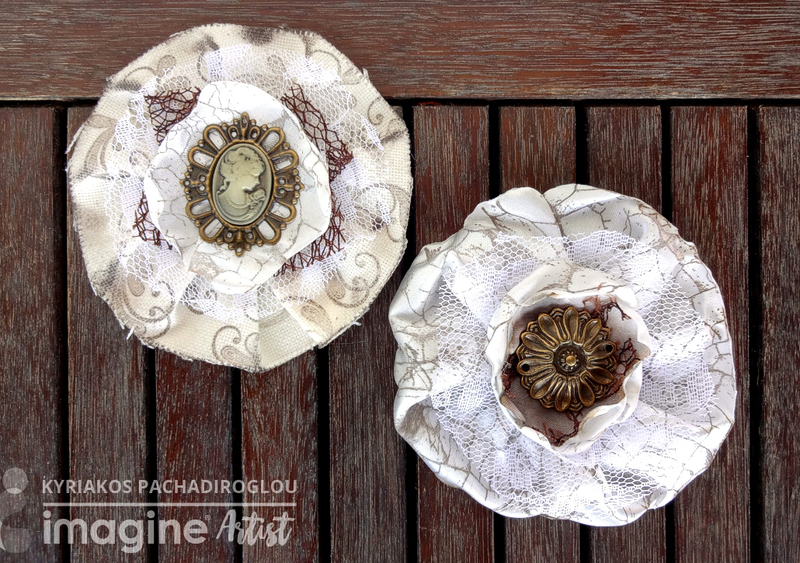 The rosettes are glued on Sheet Metal (round) from Imagine that make the ideal base to be placed on many surfaces. Cut 1 ½ inch wide and 15 inch long stripes of canvas and satin fabric and stamp them with the Memento Luxe Rich Cocoa in a repeating pattern. 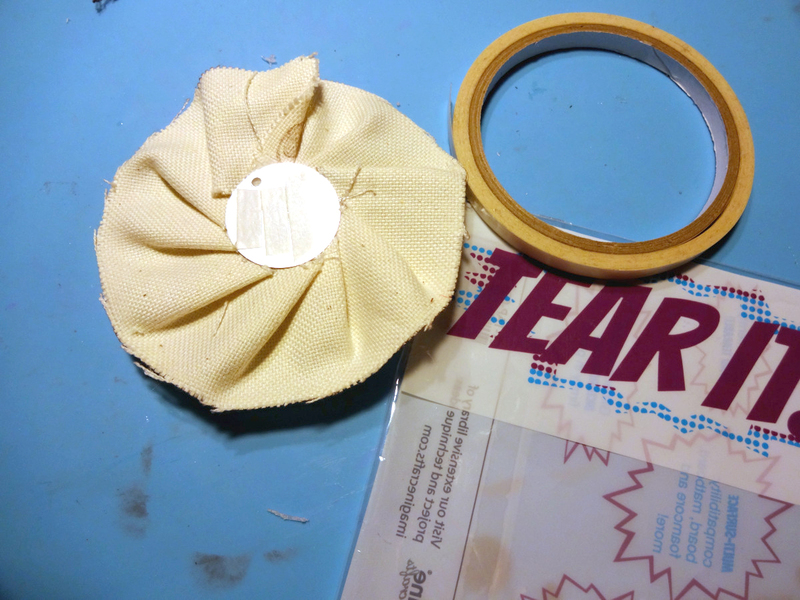 Take a 1.25 diameter Sheet Metal circle and start gluing the canvas fabric in a circular way creating pleats. Repeat the same with the satin fabric. 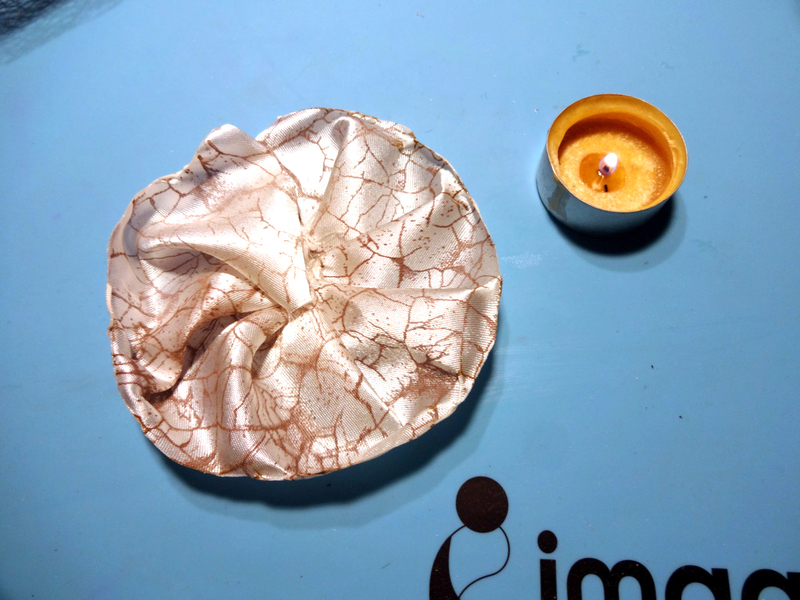 Use a tea light candle wrinkle the satin fabric on edges. 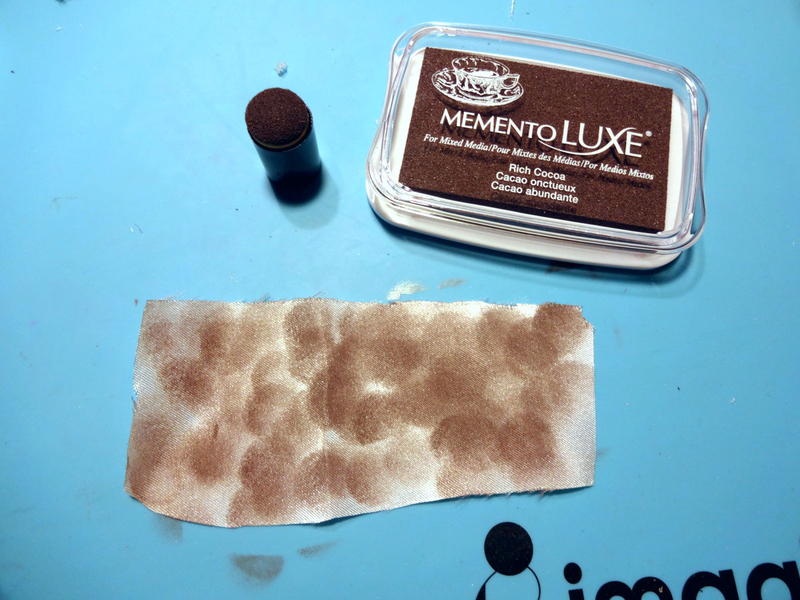 Take a small piece of the satin fabric and distress with the help of a sponge dauber and the Memento Luxe Rich Cocoa. Cut circles and repeat the previous step. 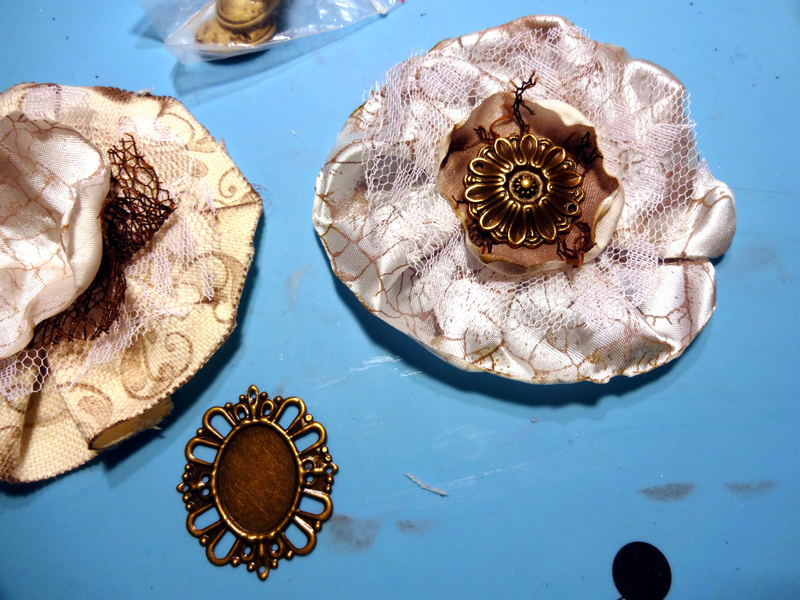 Make layers of lace and fabric by gluing to the center of the rosettes. Decorate with cameo and metallic embellishments. If you enjoyed this tutorial then please comment below or share on Facebook! 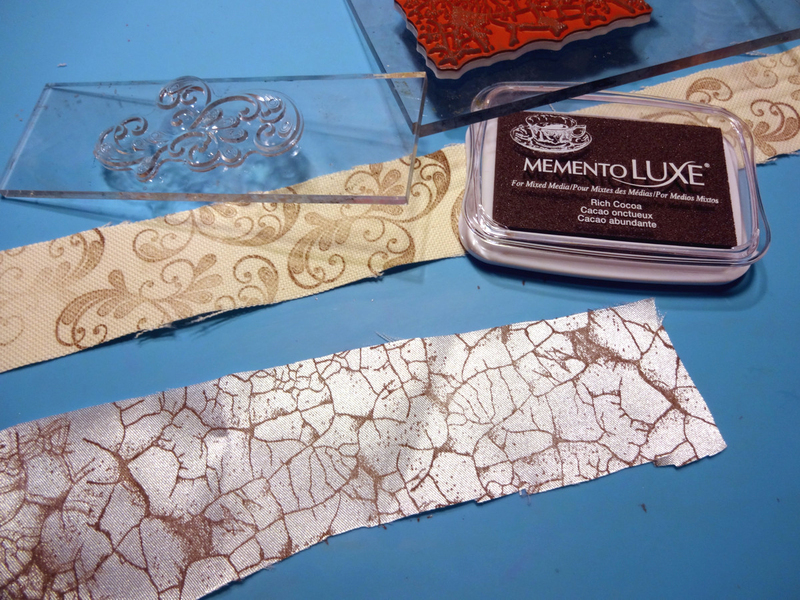 This entry was posted in Beginner, DIFFICULTY LEVEL, DIY, Home Decor, INSPIRATION, Kyriakos Pachadiroglou, PROJECTS and tagged DIY, DIY Inspiration, Handmade, INSPIRATION, Memento Luxe, Mixed Media, tear it tape. Bookmark the permalink.